2012 shall be an interesting year. It's interesting to learn that as much as this series is Ratel's vision, it's the FIA that is really pulling most of the strings. Then can the FIA please get a rid of this stupid 4 car per "brand" nonsense. According to autohebdo.fr Loeb and RÃ¤ikkÃ¶nen will drive the Peugeot 908 Hybrid4 during the Le mans test day. this is also april joke. The rumour about them driving in the new 908 for the race was killed off about 2 months ago, and since Peugeot are extremely serious about winning the race, they'll be using all their 9 regular drivers for the test day as well. That article is just an April Fools' nod to those rumours. If the signage on the hybrid Peugeot is to be believed, it will be the #8 car at the test day, and Peugeot won't want to put two unknown quantities instead of two-thirds of their strongest driving crew which is sharing that car (Montagny, Sarrazin and Minassian). Le Castellet track has run free practice and every time the highest priority has been to different car. The first training session one: # 13 Rebellion Lola-Toyota, the second free practice one # 20 Quifel ASM-Zytek and third free practice one # 12 Rebellion Lola-Toyota. Neel Jani/Nicolas Prost pulled free a third pretty rapid pace. 1.46,810 was seven-tenths quicker than second fastest (Amaral/Pla). LMP1 prototype in clearly the fastest rate has reached a new Aston Martin, who did not get the first two free practice time at all and was the third free practice about 6.6 sec behind the tip. LMP2 Nissan seems to be the correct choice of engine. Each free practice at the tip had been a Japanese engine (# 45 Boutsen Oreca, # 41 Greaves Zytek, # 46 TDS Oreca). GT2 in the first two free practice was the fastest # 77 Felbermayr Porsche and the final free practice was the # 86 Aston Young Driver. Qualifying starts just over an hour to get (14.45). World Championship status for ILMC? Why not call the ILMC the World Sports Car Championship? It already features seven rounds on three continents, which theoretically qualifies it for such status by the FIA. Well, there are a few challenges in making it happen with immediate effect. One of the biggest comes with the FIA GT1 World Championship, a sportscar series which already has the World Championship label and is governed directly by the FIA. Although working in concert with the FIA in various activities, including various safety and homologation aspects, the ILMC is more or less organized entirely by the ACO. â€œThe championships in endurance has always been very much led by the ACO with the blessing from the FIA, so I donâ€™t see a reason why that would change,â€� said ILMC director Frederic Henry-Biabaud. â€œThere is a very strong work being done between the FIA, the car makers and the ACO from a regulations point of view. There are varying opinions on how a World Championship label could affect the ILMC. Some think adding it just for the sake of the name might not have too much of an impact if all of the events are not yet world-renowned. Frederic Henry-Biabaud, left, is optimistic of a strong future for the ILMC. â€œYouâ€™ve got to give it time to grow,â€� said Audiâ€™s Allan McNish. â€œIf I look at Petit Le Mans, I was there in the first one in 1998. And you look at it today. Sebring stands on its own two feet and Petit now also stands on its own two feet. â€œAny event that gets over 100,000 people to come to it, which is more than any Formula One Grand Prix I can think of, then itâ€™s obviously a big race. I think with the championship, you have to allow it to find its feet and grow in that respect. As Henry-Biabaud explains, thereâ€™s no reason to make a rash decision without carefully analyzing the situation from all angles and gaining the feedback from manufacturers and teams. But not everyone appears to be on-board with the ILMCâ€™s rapid growth plan. Patrick Peter, organizer of the European-based Le Mans Series, said earlier this month at the seriesâ€™ official test day that the LMS and ILMC races would be separate in 2012, unlike this yearâ€™s partnership of three shared events. While Henry-Biabaud dismissed those reports, saying that there are normal discussions ongoing, he did reiterate the importance of the ALMS, LMS, as well as the Asian Le Mans Series, in helping complete the endurance racing ladder. â€œWhat will be important will be to make sure that even though we keep climbing all the way up to the 24 Hours of Le Mans, we make sure that we keep the strong basis of the pyramid of the continental series,â€� Henry-Biabaud said. â€œWhether itâ€™s the Le Mans Series or American Le Mans Series or the Asian Le Mans Series of tomorrow. With the ACO having a vested interest in the LMS, the situation may well work itself out over the coming months. But if it doesnâ€™t, it could leave the European sportscar racing scene in a bit of a sticky situation. With three of the five LMS rounds this year also doubling as ILMC races, a number of teams have opted to contest both championships. But if the ILMC and LMS run separately next year, and the ILMC is forced to hold standalone events in Europe, teams like Rebellion Racing, which is represented in both championships this year, would likely have to choose between one or the other. â€œThe ILMC appeals to manufacturers immensely because it gives them the world precedence,â€� said Rebellion team manager Bart Hayden. â€œFor private teams, itâ€™s exciting because weâ€™re competing on that same stage. While thereâ€™s no doubt growing pains in any new championship, if the ACO is able to work out some of the early hurdles, the ILMC could become the next big thing in motorsports, even with or without a World Championship title. Rebellion Racing driver Neel Jani took pole position for the opening round of the Le Mans Series at Paul Ricard. The Swiss driver set a best time of 1m46.783s in Rebellion's lead Lola-Toyota LMP1 coupe to edge out former LMS champion Emmanuel Collard, driving for the re-formed Pescarolo team. Jani was less than three tenths of a second ahead of Collard in the Judd-powered Pescarolo and a further two tenths ahead of the ASM Zytek driven by Olivier Pla. Jani, who is paired with Nicolas Prost, said: "It is a good start, but it is very close. The Pescarolo and the Zytek are close to us, closer than I expected." The Aston Martin AMR-One, which is making its race debut at Paul Ricard this weekend, ended up only 11th quickest in the hands of Stefan Mucke. The German's time of 1m52.267s left him behind six LMP2 entrants. TDS Racing claimed P2 honours with Mathias Beche. His time of 1m48.928s in the French team's ORECA-Nissan was nearly a second clear of Dominik Kraihamer in Boutsen Energy Racing's similar car. Gianmaria Bruni took pole in the GTE class (formerly GT2) for the AF Corse Ferrari team. The Italian's time of 1m58.522s in the new 458 Italia was two tenths quicker than Tomas Enge aboard Young Driver AMR's Aston Martin Vantage GT2. Pescarolo Sport is back in business! Congratulations to Henri, his team, and Christophe Tinseau/Emmanuel Collard/Julien Jousse. I'm quite disappointed in the AMR-One, just hasn't been what I expected from the start of the whole project (even besides the fact that I think the car is not only hideous, but also looks like a little step back, I mean in the sense that looking at it, compared to that great coupe they had, it just doesnt have that feel that it's going to be a class-threatening car, I just don't see it having what it takes to rival the 908 or the new Audi. We'll see...but...for now I'm not holding my breath for this project. Le Mans Series, 6 Hours Of Le Castellet Result. Start Chaos 2011 Le Mans Series at Le Castellet video. This weekend, the 2011 FIA GT1 World Championship travels to Belgium for the second time. In 2010, Spa-Francorchamps was the host venue and this year Zolder will stage the first European round of the new season. The circuit was a firm favorite on the FIA GT Championship calendar and was the stage for the final round of the 2009 season that saw the checkered flag come down on 13 years of FIA GT history. Now, after a gap of one year, Zolder is included on the calendar of the FIAâ€™s newest World Championship and is sure to provide two action-packed races. Former F1 driver Jean-Marc Gounon highlights level of GT Itaipava Brazil. Marc Basseng and Markus Winkelhock completed a dominant weekend in Zolder, romping to a comprehensive Championship Race victory in their All-Inkl.com Munnich Motorsport Lamborghini No.38 - a day after collecting the team's first GT1 win in the Qualifying Race. It was an impressive performance from the German duo who led from pole and crossed the line over nine seconds ahead at the flag, capturing the lead in the Drivers' Standings in the process. Second was the Aston Martin No.4 of Christian Hohenadel and Andrea Piccini who again benefitted from some slick work from the Hexis crew in the pit stop. Third place went to the Young Driver Aston Martin No.7 of Alex Muller and Tomas Enge with the Swiss Racing Lamborghini No.5 of Karl Wendlinger and Peter Kox pipping the Exim Bank Team China Corvette No.11 of Mike Hezemans and Nicky Catsburg at the line to clinch fourth. A torrid start saw a collision between the two Sumo Power GT Nissan GT-Rs which was triggered by the DKR Engineering Corvette No.47. In fact it was a trying day for the Nissan quartet with only the No.23 JRM car finishing the race. The No.37 Lamborghini of Dominik Schwager and Nicky Pastorelli, which had set pole in Abu Dhabi, was also an early casualty, while the No. 6 Lamborghini of Jiri Janak and Max Nilsson wasn't able to start the race due to an oil pump problem. As the field came through the first lap it was the No. 38 Lamborghini in the lead from the No. 11 Exim Bank Team China Corvette of Mike Hezemans and Nicky Catsburg. The field remained tightly bunched however with less than four seconds covering the top eight after five laps, and the order condensed further three laps later when the Safety Car came out. Peter Dumbreck had dived down the inside of the No.40 Marc VDS Ford GT and looked to have the line, but spun as the Ford refused to cede ground and was collected by the helpless No. 9 Belgian Racing Ford GT - the resulting damage causing a lengthy Safety Car spell. With the race resuming just one lap before the pit lane window opened, pit stops were crucial and Hexis again pulled off a superb stop to help the No. 4 Aston Martin of Andrea Piccini and Christian Hohenadel vault from ninth to second. All-Inkl matched Hexis' superb 49-second stop however, and the No. 38 Murcielago emerged with a healthy lead which it proceeded to build in the closing stages, eventually coming nine seconds clear to give the team its second consecutive victory in Zolder. The No.11 Corvette had been second after the pit stops but was picked off firstly by the No.4 Hexis car and then by its sister No.7 Young Driver Aston Martin - with the two DB9s rounding out the podium. The Corvette tried to respond and exerted huge pressure on the Aston, only to fade badly in the closing stages and fall into the clutches of the No. 5 Swiss Racing Lamborghini - which claimed fourth on the run down to the chequered flag, 0.025s ahead of Catsburg in the Corvette. Hexis' No. 3 DB9 claimed sixth ahead of Darren Turner and Stefan Mucke in the No.8 Young Driver Aston Martin, which had to work extremely hard to keep the No.41 Marc VDS Ford GT of Frederic Makowiecki and Maxime Martin at bay. Michael Krumm and Lucas Luhr were the top Nissan pairing in the No.23 JRM GT in ninth, with the No. 40 and No.10 Ford GTs rounding out the finishers. Coming out of Zolder, Marc Basseng and Markus Winkelhock lead the Drivers' Standings on 49 points ahead of Stef Dusseldorp and Clivio Piccione on 36 points. GT1 next heads to Portimao, Portugal, in four weekends' time for the third round of the 2011 championship. Martin Bartek, team principal of the Matech Competition GT teams, has died at the age of 44. Dyson Racing's Guy Smith backed up his practice pace to take pole position for round two of the American Le Mans Series at Long Beach in a depleted LMP1 field. 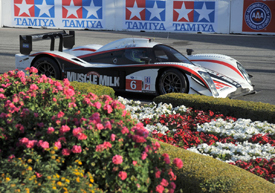 The Muscle Milk Lola-Aston Martin was a dominant overall winner of the American Le Mans Series' two-hour Long Beach race, while Joey Hand and Dirk Muller came out on top for the Rahal Letterman Lanigan-run BMW squad in the ultra-competitive GT field. Audi has revealed the colour schemes that its three new R18 TDIs will race in at Le Mans this year ahead of this weekend's pre-event test day. The great strength of the 24 Hours of Le Mans 2011 begins coming Sunday. 54 cars will participate in this unique testing day, scheduled a month and a half before the 11th and 12th June. Hereâ€™s everything you need to know about this Test Day. Dindo Capello has smashed speculation that his retirement from the sport is imminent. The 46-year-old Audi veteran, who spoke to SPEED.com at last monthâ€™s Intercontinental Le Mans Cup season-opening Mobil 1 Twelve Hours of Sebring, had been rumored in the Italian press to be hanging up his helmet at the end of the season. In view of the effects caused by the earthquake that hit northern Japan, the GTA Co.,Ltd (Representative Director: Masaaki Bandoh) has made the decision to postponed the 2011 SUPER GT Round 1 "Okayama GT300km Race" originally scheduled for April 2nd to 3rd. The company is currently exploring the alternative dates and will announce them once finalized. In addition, preparations for the Round 2 "Fuji GT400km Race" (scheduled for April 30th to May 1st) and other events beyond are proceeding as planned, however, decisions on the event schedules will be made in accordance with the developments in situation. Peugeot is losing most of its time to the Audis in the Porsche curves. Interestingly enough, the fastest Peugeot through the Porsche curves is the old Oreca 908 HDi FAP. Maybe Audi is taking more advantage of the larger front tire solution then Peugeot at the moment at that section of track. Overall the Peugeots were considerably slower in their stints until a few last minute dashes at the end of the day. I think those last minutes laps showed their true pace, just a tick off of the Audis, at the moment. The race started under the worst of conditions with heavy rain and strong winds, which meant that everything hinged on the teams' choice of tires. Bad tire choices by a number of teams, including the pole-sitting (first qualifying) DENSO SARD SC430, and spin-outs in the wet conditions hampered one team after another. One driver who seemed to be unaffected by these bad conditions was Benoit Treluyer, who started from 6th position on the grid in the MOTUL AUTECH GT-R. In the early stages of the race he moved up steadily to take the lead. The GT300 class race became an impressive runaway victory for the pole-starting HANKOOK PORSCHE driven by Masami Kageyama and Tomonobu Fujii. The team's Hankook tires fit the track conditions perfectly and enabled the drivers to build a 30-second lead over the field by the end of the race. This weekend the 2011 FIA GT1 World Championship travels to the AutÃ³dromo Internacional do Algarve for the second time. The 4.7km circuit has become a firm favourite with the teams and drivers due to the exciting nature of the track that allows plenty of overtaking opportunities. For years, teams have used the 1000km of Spa as a dress rehearsal for the coveted 24 Hours of Le Mans. But the six-hour enduro in the Belgian Ardennes takes on a whole new level of importance this weekend with it also playing host to the second round of the Intercontinental Le Mans Cup. With 56 cars set to take the green on Saturday, nearly all of the leading contenders are here to do battle in what will likely turn out to be one of the strongest fields seen all year in the world of sportscar racing. Nissan swept the podium positions in the GT1 World Championship qualifying race at Portimao, with the JR Motorsports cars of Peter Dumbreck/Richard Westbrook and Lucas Luhr/Michael Krumm finishing first and second ahead of the Jamie Campbell-Walter/David Brabham Sumo Power machine. Peugeot warmed up for the Le Mans 24 Hours in the best way possible by winning the Spa 1000km for a fifth successive year. JR Motorsports took its second GT1 World Championship win of the weekend in the main race at Portimao, with Lucas Luhr and Michael Krumm triumphing after their team-mates Richard Westbrook and Peter Dumbreck hit gearbox problems.